AquaMon is a tool for modern farming. It automatically collects data from local and remote sensors and uploads the sensor data to the web server. Once the data is resident on the web server, RSVP (Remote Sensor Viewing Platform) displays it in the format chosen by the grower. The system also works in reverse; the grower’s web server inputs controlling field operations. AquaMon offers the grower the flexibility to monitor parameters important to his crop and remotely control operations critical to his farm. Available sensors allow monitoring soil conditions, climate, and equipment status. The AquaMon RSVP web server issues alarms when sensors reach a preset limit or can avert harm by activating preset controls within the sensor network. The RSVP display can be customized by the user through a series of simple configuration screens. Separate screens are provided to configure the node, the sensors connected to the node, as well as scale and alarm set up. RSVP configuration can only be modified after the correct user Name and Password are entered. 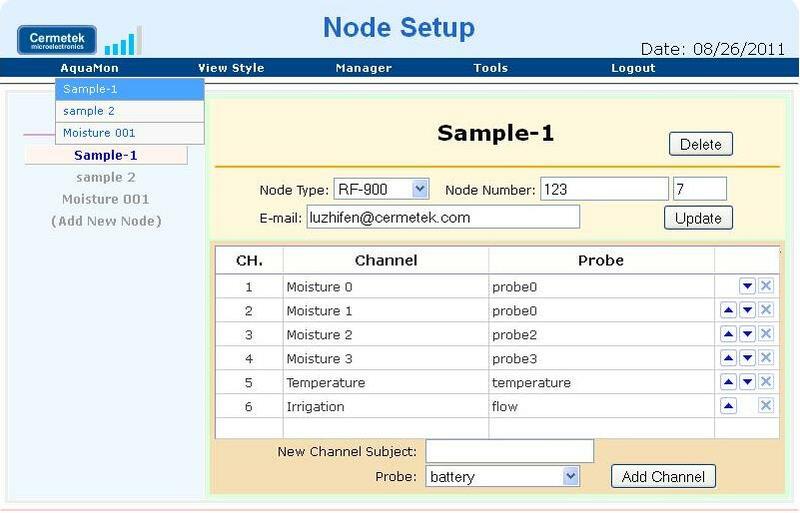 The Node Setup screen allows the user to define each node in terms of both the network and the attached sensors. It also allows programming of an email address to which alarms can be sent. 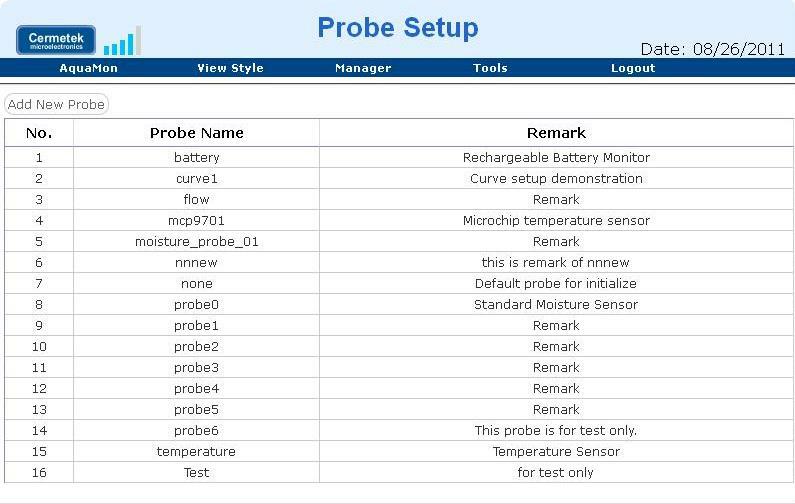 The Probe Setup screen allows the user to define each additional sensor probes for use in the network. Each probe used in the Node Setup screen must first be defined Probe Setup screen. 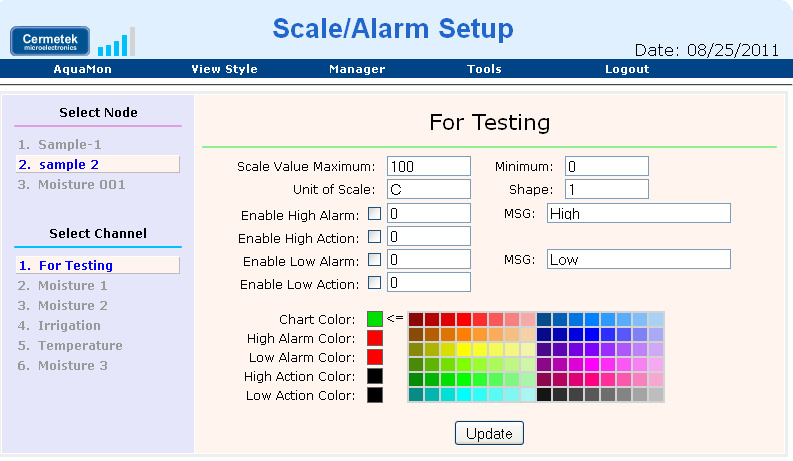 The Scale and Alarm Setup screen defines the display of each sensor. The user selects the node and channel on the left side of the screen and then selects the scale and units of the display, sets any desired alarm limits and even sets chart colors. 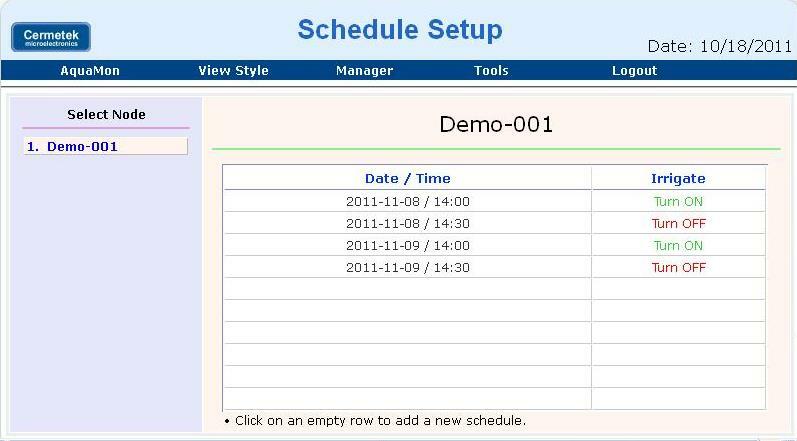 The RSVP software can also be used to schedule future irrigations. RSVP allows the authorized system manager to enter the date and time to activate pumps and valves to initiate irrigation. · Improve yields with precision irrigation, reduce power costs with smart pump control, and prevent crop damage with automated alarms. Cermetek reserves the right to make changes in specifications at any time and without notice. The information furnished by Cermetek in this publication is believed to be accurate and reliable. However, Cermetek assumes no responsibility for its use, or for any infringements of patents or other rights of third parties resulting from its use. No license is granted under any patents or patent rights of Cermetek Microelectronics, Inc.